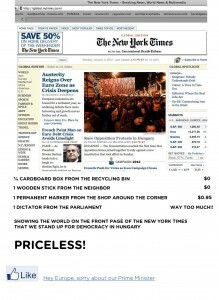 Hungary is ‘enjoying’ an extensive foreign media coverage of the financial and political crisis in the country. Many well-known mainstream media outlets, such as the BBC , the Guardian , the New York Times  or Al Jazeera  have reported on the January 2, 2012, protests against the new constitution, which came into effect on January 1. Hungarian citizens, too, are constantly using blogs and social media to express their criticism of the government's measures and share the news of the country's volatile economy. Although the rallies are growing more and more frequent, we confine this coverage to the protest that took place last Monday 2 January, presenting some Hungarian citizens’ views on the event. The purpose of the January 2 rally was to speak up against the new constitution  designed by the governing Fidesz  and KDNP  parties. To celebrate the constitution, the government organized a high-profile event at the Hungarian State Opera . The rally against it took place right outside the Opera. Non-governmental organizations, civil movements and some opposition parties allied for the time of the protest to demonstrate that opposing the government's politics results in joint forces. The organizers wanted to avoid the influence of party politics on the event, and therefore only the representatives of civil movements and trade unions were the speakers. […] My first thought: is democracy in danger? I think it is not. According to the calculations of Fideszfigyelő blog  (Fidesz monitor) [hu] some 32,000 or 50,000 people attended the protest. There were conflicts between the majority and the extreme-right protesters, who were also allowed to hold a ‘small counter-rally’ at the same place (as you can see on this YouTube video ). Kettős Mérce reported  [hu] that two activists of LMP (Politics Can Be Different party) were beaten by the extremists, one of them was searched by the police. According to some rumours , high profile guests of the constitution's celebration had to use an escape route under the Opera to leave the building, journalists of index.hu news site interviewed  [hu] the guests leaving through the Opera's back doors.